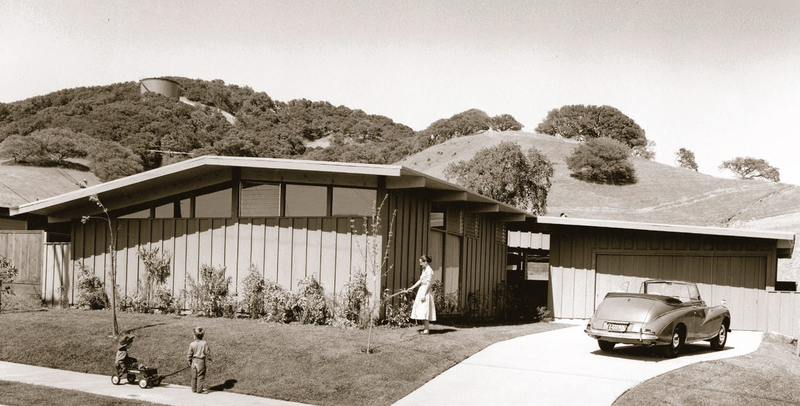 Before there were Eichlers in Marin’s Terra Linda, there were Alliance homes, which arrived in 1954 to put a new face on the area with affordable, low-slung modern housing, like the home pictured above. 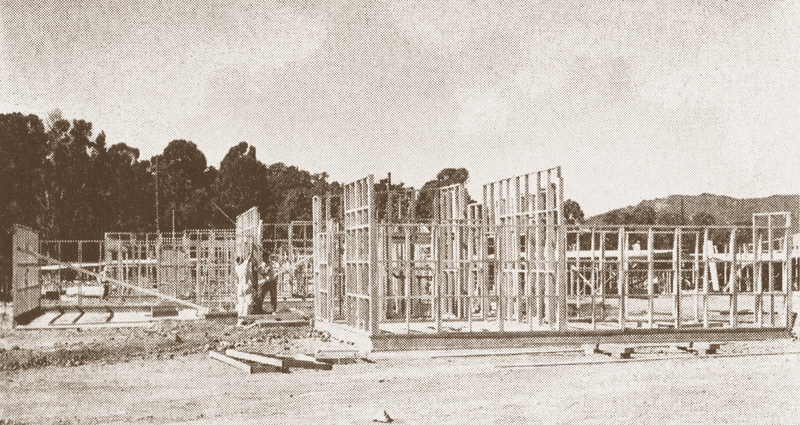 Alliance home under construction, mid-1950s. Terra Linda grew quickly. 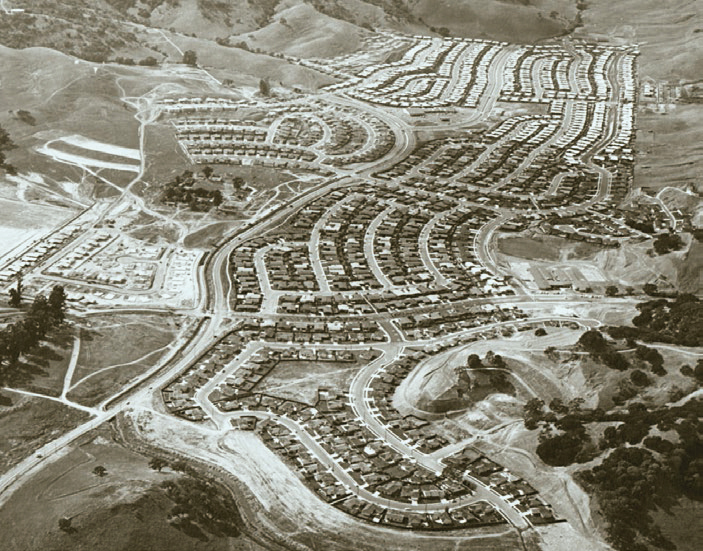 This aerial shot, from 1959, shows a mix of hundreds of Alliances and Eichlers. Few places possess as rich a collection of mid-century modern dwellings as Marin County. Besides its hundreds of custom homes by Bay Area master architects reaching back to the mid-1930s, Marin is a treasure trove of tracts built by Joe Eichler, ranging from his simple, early models in Terra Linda to his enchanting, little hideaway at Sleepy Hollow to the grand, high-peaked beauties in Lucas Valley and overlooking the Bay in Strawberry Point. Fans of modernism in this most sophisticated of counties appreciate what they have. Consider the tale of Leo Bersamina, an artist, college instructor, and surfer who was determined to live in a mid-century modern home in Marin but couldn't bear the price tags coming from the Eichler tract in Terra Linda, where he had been renting. "I saw this thing—and I thought 'what is this?!'" Bersamina recalls. What he saw was a photo of an L-shaped house, low gabled with a clerestory window, and with living area glass-walled on both sides. And it wasn't in San Rafael, which is known for its modern tracts—but in Novato, a city at the northern end of the county that's one of its sleepier suburbs. "I saw where it was, and I thought, 'where the heck is that?'" Bersamina says. The photo appeared in a realty listing that ignored the home's mid-century modern style. "They were not playing it up at all," he says, adding, "For me, I was looking for something like this." What Bersamina bought into is Lynwood Park, one of Marin's forgotten mid-century modern developments. It's a particularly interesting neighborhood for Eichler fans because it was designed by Anshen and Allen, Eichler's original architects. Novato's two other forgotten modern tracts, Orchard Park and Ferris Gardens, also come with history. Their homes are co-designed by the legendary Cliff May—he was the inventor, or at least chief popularizer, of the suburban ranch house—with design partner Chris Choate. A fourth non-Eichler tract in Marin is better known than the three Novato neighborhoods, but still too little known. These are the Alliance homes of Terra Linda, which were built in the early 1950s, shortly before the Eichlers that sprouted up alongside them. The Terra Linda Corporation behind the Alliance homes won attention and praise when the company helped to build "the first planned town in this country to have all contemporary houses," according to the shelter magazine House + Home in 1954. At build-out, the magazine projected, "Terra Linda will have the largest number of contemporary houses ever built in one place." How strange is it that in Marin mid-century modern neighborhoods can hide in plain sight, when there are admirers out there who are looking for something more affordable in that category?